The journal of Aaron Thomas, housed in the University of Miami Libraries Special Collections Division, is a 374 page leather-bound volume containing approximately 367 pages of handwritten material. The journal begins on June 15, 1798 and concludes on October 26, 1799, and chronicles the experiences and adventures of a British seaman serving in the Royal Navy aboard HMS Lapwing in the West Indies during the French Revolutionary wars. The journal contains insightful, first-hand accounts of naval operations, customs of the day, and humorous, detailed anecdotes involving shipmates and superiors. Thomas, who joined the navy in 1793, includes entries regarding the health and punishment of the men aboard ship, as well as his personal views on slavery, religion, and morality. With the exception of the final three pages, all entries are written in Thomas's hand. Approximately two hundred and forty pages of the diary are transcribed verbatim, with spelling and punctuation intact. Words appearing in italics are added to facilitate reading, and square brackets are used to identify unintelligible writing. Thomas's journal is apparently one of a series that this well-traveled sailor wrote over the course of his life. The only other known journal in existence was published as the Newfoundland Journal of Aaron Thomas, edited by Jean M. Murray. This journal was written aboard HMS Boston in 1794 and 1795. The format of the Newfoundland volume differs from the West Indies journal as the former was intended to be a history of Newfoundland and contains little personal information. The West Indies journal of Aaron Thomas is similar in style and content to The Nagle Journal, edited by John C. Dann. This diary was written in 1775-1841 by Jacob Nagle, a member of the Royal Navy who also spent time in the West Indies. There is another manuscript in existence that provides a first hand account of life on the Lapwing, written by Francis Hiernan between April 5, 1796 and September 25, 1800. This document is housed in the collection of the National Maritime Museum in Greenwich, London, U.K. The British islands in West Indies were originally attractive to a small group of free white men and indentured servants, lured by the promise of land upon completion of their servitude. British planters sought to establish a tobacco crop, however, their product proved to be inferior to tobacco grown in the North American colonies of North Carolina and Virginia. Landowners began to grow sugar cane, which required larger plantations and an increased labor force. Once sugar plantations began to dominate the agricultural scene, the face of society in the islands changed. Sugar plantations required vast amounts of acreage and a large work force, and indentured servants, no longer lured by the promise of land, were unwilling to travel to the West Indies. Island landowners came to rely on the slave trade to provide labor for the sugar plantations. Thus, when Aaron Thomas arrived in the West Indies in 1797, he found an economy built on the sugar trade and a society comprised of slaves, plantation owners, and men of the navy. As the cultivation of sugar cane depleted the small amount of land available for agriculture, the development of new land became increasingly important. 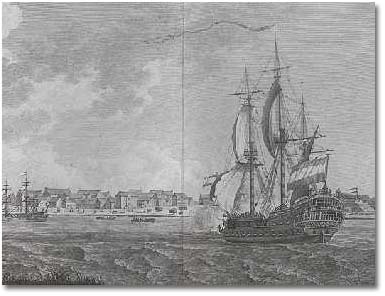 Aaron Thomas arrived in the West Indies as the French Revolutionary wars were underway, and his ship, the Lapwing, a 28 gun frigate commissioned in 1785, was sent to patrol the waters of the West Indies in order to protect and defend British colonies there as well as to maintain the trade route. The ship cruised the area now known as the lesser Antilles, and patrolled the vicinity of St. Kitts, Nevis, Antigua, Anguilla, Martinique, and Guadelupe. However, Aaron Thomas also includes in his journal a well-documented account of his voyage to Surinam, made in August of 1799, in a successful attempt to take the Dutch colony at Paramaribo for the British. Entries in the Aaron Thomas journal can be categorized into three different types. The first consists of daily entries that provide a record of naval operations and personal anecdotes. Thomas, who served as Eleventh Gunner, associated with ranking officers as well as the youngest mates, with whose "bodily welfare he was charged." Thomas records many thoughts and impressions of his Captain, Thomas Harvey, often referring to him as young Solomon, "as he knows every thing, as he thinks" (p. 106). "Never stop at an Inn, nor go into a Shop to buy goods, if you see the Master has a Superfine Coat on. If you put yourself into the hands of these double & treble superfine gentry, you may depend upon it, they will exact something from you, to be spent in a superfine manner. --There is generally plenty of Inn & Shops, whose Masters are content with a Second Cloath Coat". The third type of entry includes records of the personal correspondence both sent and received by Aaron Thomas. The majority of letters were directed to his brothers William and John, as well as to an acquaintance who had served as a crew mate of Thomas' onboard HMS Boston. Collectively, the correspondence offers insights into Thomas' youth and the life that he led prior to entering the navy in 1793. Thomas also included pen sketches, financial records and accounts, poetry, and graveyard epitaphs collected during his forays ashore. The journal also extends beyond Thomas' experience in the West Indies to include ten pages (110-119) of reminiscences of Thomas' travels to Germany and Denmark and four pages (22-25) which he entitles "Detached memorandums, relating to Newfoundland, which I overlooked in my history of that country; compiled in 1794." The diary is unique and valuable document containing the thoughtful musings of an intelligent, moral man. Thomas writes in a clear hand and a coherent style; with the exception of portions of his personal correspondence, in which he freely interchanges the Portuguese language for English as well as occasionally employing a technique of spelling words backwards. Whether Thomas does this in an effort to disguise the content of the letters or to stave off boredom will remain unknown. Elizabeth H. Locke, graduate student in the School of Library and Information Science at the University of South Florida, completed this website as part of an independent study project under the supervision of William E. Brown, Jr., Head of Archives and Special Collections at the University of Miami. The task included the transcription of approximately two hundred and forty pages of the journal of Aaron Thomas, researching background information on Thomas, the West Indies, and the Royal Navy, and scanning pages of the journal and creating images to illustrate the site. The University of Miami Library will maintain this site and continue to add material as it becomes available. Suggestions, comments, and additional relevant information are encouraged. Please contact the University of Miami Libraries, Special Collections Division, Coral Gables, Florida. This site was placed online April 30, 1999; last updated December 15, 2006.